It isn’t enough to just get gear in Battleborn. If you’re eager to truly optimize your build and unlock skill-specific bonuses tied to each characters, then you’re going to need rare legendary gear. Instead of throwing cash at legendary loot packs, try focusing on lore challenges. Every hero sports a set of five, and completing them all unlocks a guaranteed piece of legendary gear. Learn all about the challenges and exactly how good each piece of gear is with our full loot guide below. Loot comes in many forms in Battleborn. At Command Rank 3, the Gear Bank becomes available in the Command tab, allowing you to store or sell any items you might want to hang onto for later. Most gear isn’t tailored to any one character, and can be earned through a variety of methods. Mostly, those methods involve playing the game and earning victories online with your friends. But, if you’re looking for a less random strategy for grabbing that first piece of legendary gear, see what’s required of your favorite character with our complete legendaries guide. 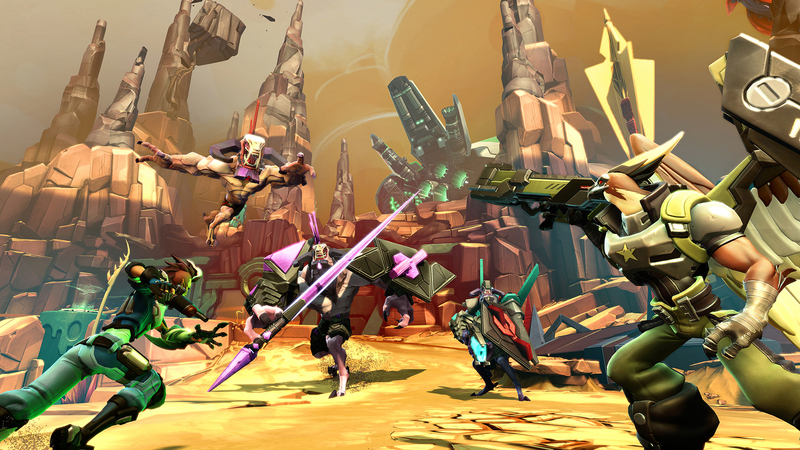 Don’t forget to check out 10 Reasons Why You Should Be Playing Battleborn. It’s out now, so you’ve got no excuse. Each character can unlock one  unique piece of legendary gear by completing all five Lore Challenges. Completing challenges also unlocks audio logs that reveal some of that character’s backstory. Complete all five to get your legendary gear. Below you’ll find entries per character on the requirements for completing all five Lore Challenges and the bonuses each piece of legendary gear provides your hero. Complete five Lore Challenges to unlock legendary gear. Ambra Only: The Staff of Radiance slowly generates its own Heat. Cherished remnant of the darkened Jennerit throneworld. Attikus Only: Attacks charged by Hedronic Arc will slow on the first hit for each enemy. Benedict Only: Landing rocket hits while airborne reduces all active cooldowns by 1 second. The Dwarf’s Favorite Axiom: Deal 25,000 explosive damage with Axe Toss while energized by Runes of Power. The Runes That Best Reflect My Mood: Self-heal 10,000 damage with the Ekkunu Greatshield while energized by Runes of Power. Boldur Only: When Ekkunu Greatshield breaks, gain 0% to all damage for +400% seconds. Caldarius Only: Aerial Assault heals Caldarius for 50% of total damage dealt. Forged by Verod Rath as consolation after Caldarius was denied Sustainment. Deande Only: Activating Holotwin causes your shields to immediately begin charging. An energized blade of Deande’s tessurim fan that converts stored energy to her shield. El Dragon Only: Clothesline and Dragon Splash gain +25% damage, but damage El Dragon on a miss. “Second Place Championship Belt” modified to emit an electrical discharge on impact. Galilea Only: Clearing Galilea’s Corruption grants 105 health over 5 seconds. “We’re not sure what Galilea is storing here, but it seems to be beneficial.” – U.P.R. Tech Div. Ghalt Only: Enemies hooked into a Scraptrap take 50% more damage from the trap. ISIC Only: Having Energy Aegis break reduces Rotating Ward’s active cooldown by 6 seconds. Modified LLC shield charger permanently linked to ISIC’s global ID number. Kelvin Only: Missing with Chomp resets its cooldown for 1 immediate re-use. Kelvin is rumored to draw energy directl from plasmite shards. Kleese Only: Healing allies charges Kleese’s shield by 50% of healing done. Marquis Only: Critical hits reduce the active cooldown on Bindleblast by 2 seconds. Green tendrils of hard organic substances entertwine Mellka’s U.P.R. pistol magazines. Miko Only: Add 50% of Kunai poison damage dealt to your next Healing Beam pulse. In each dagger thrown by Miko is a spore of its home, the great planet of Mikollopria. Montana Only: Slows Minigun Heat generation by 50% when Heat exceeds 85%. Orendi Only: If Shadowfire Pillar deals no damage, your next pillar deals 30% more damage. I Am Literally Made For This: Fire 50,000 rounds. Oscar Mike Only: +15% Movement Speed while Stealth Generator is on cooldown. Phoebe Only: Gain +5% to all damage with each consecutive hit with True Strike. Rath Only: Gain 1% Life Steal with each use of Genetic Syphon, up to 10%. Reyna Only: Charging an ally’s overshield with the Plasma Puslse also heals them. Shayne & Aurox Only: Melee strikes add 20% of their damage to the next Boomerang hit on the target. A rare intertial broadcaster which can transmit stored kinetic energy. The Last: Win “The Archive” on Advanced difficulty without dying once. Vengeance for the Lost: Kill 1,000 Jennerit troops. Thorn Only: Nature’s Curse instantly charges at full draw. Ancient relic that confers the combat skill of past Aelfrin warriors into the wearer. Toby Only: Can set 2 Arc Mines at one time, but each mine deals -40% damage. Brought to you on behalf of Toby and Berg’s infamous “Friendship Raids”. Whiskey Foxtrot Only: Reloading an empty magazine grants +15% Fire Rate and Reload Speed for the next mag. Close kept secret of a lost civilization, this firearm lubricant is one-of-a-kind.